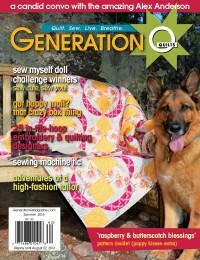 Anyone who knows me even a little bit knows I am a close-enough-is-good-enough quilter. 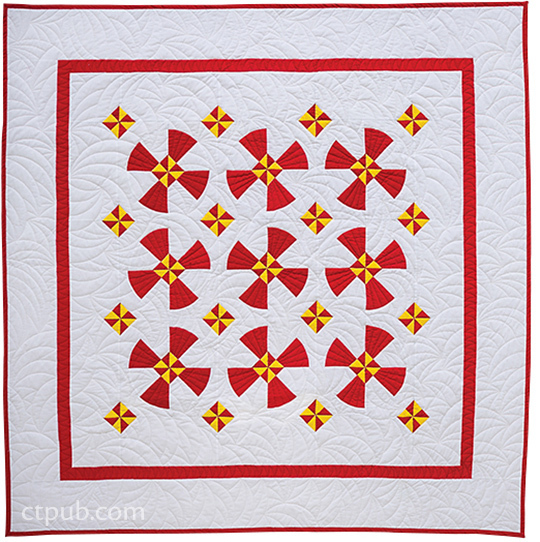 I often make my quilts up in my head as I go along, and hardly anything is a mistake. 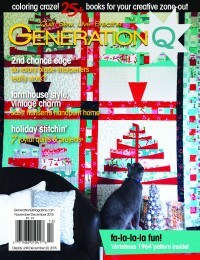 I call those “design choices” or “alternate quilting opportunities.” And yes, I just made that up. So it goes without saying that I stay away from curved piecing. I leave that to my more precise friends – you know who you are and that I love you! – but it’s never seemed like something that I in all my impreciseness could attempt, much less be successful with. 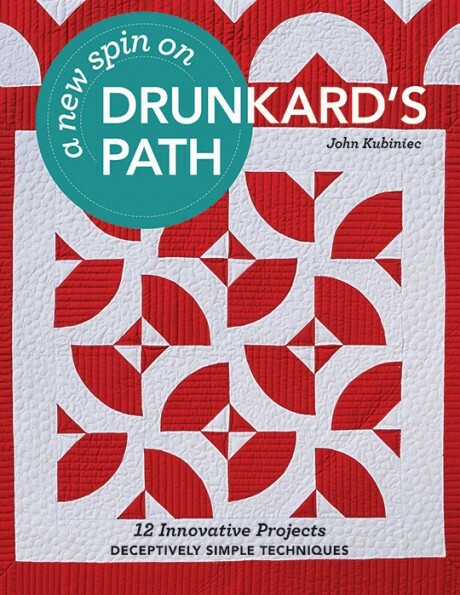 Until Teri Lucas, our brave and inspiring Community Editor, gave me the assignment of reviewing John Kubiniec’s latest book, A New Spin on Drunkard’s Path. I sat down, read it, and thought, wow, there might be hope for me yet! He wrote this book in a very approachable, kind way, more like a friend giving you advice than a teacher telling you, this is how you make this block. 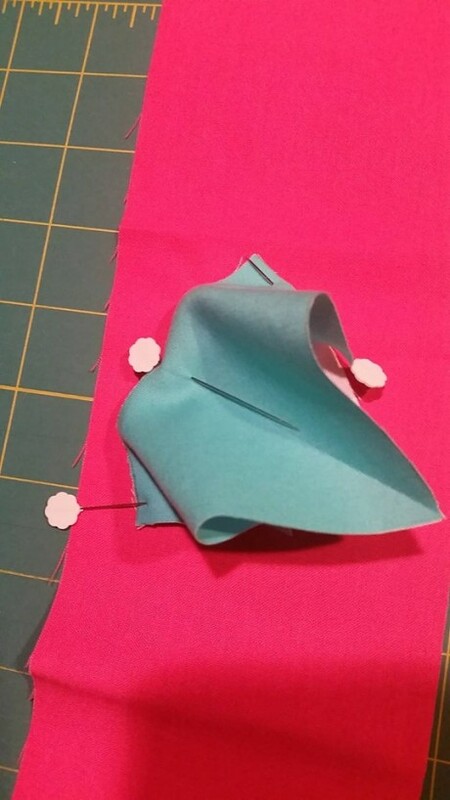 His tone of gentle encouragement motivated me to pull out my Angela Waters drunkard path templates, some pins, pretty pink fabric, and go for it. The step-by-step illustrated directions were a godsend. He broke it down into manageable steps, which I followed literally one after the other, and voila! I had a very pretty pink and white drunkard’s path block. I’m inspired. I’m awed by the 12 projects and the incredible approach John took. It’s like he was here, telling me to just go slow, enjoy learning a new technique, and that whatever I made, it was going to be more than good enough. His advice to break down a huge project into manageable pieces was spot-on. 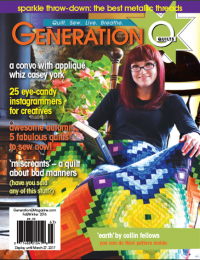 Who isn’t intimidated when they see a complex pattern and a pile of gorgeous but endless fabric? But have no fear. John has the answer. Take your time, use your pins, and if it’s all going wrong, walk away and clear your head. The joy is in the journey, as they say. And guess what? There is a giveaway! Leave a comment below answer the following question: Milk or Dark Chocolate? Winners from the U.S. will receive a hard copy of the book; international winners will receive an electronic copy of the book. In addition each winner will receive a set of Marti Michell Drunkard’s Path templates. Good Luck! Congratulations Comment #32 – Lou! 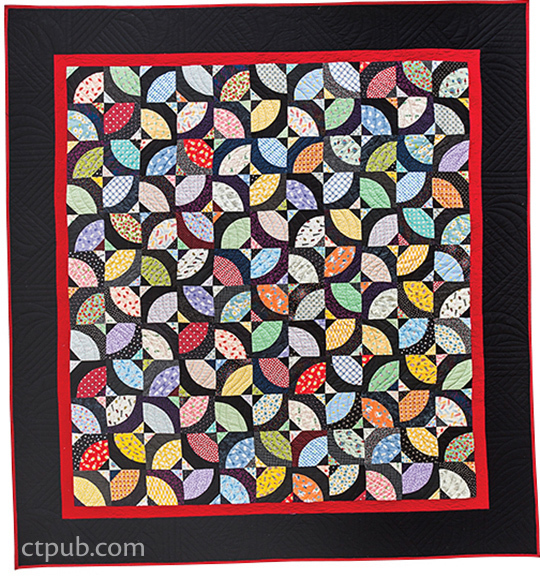 You’re the winner of a copy of A New Spin on Drunkards Path and a set of Marti Michell Drunkards Path templates. We will contact you by email to get this in the works. 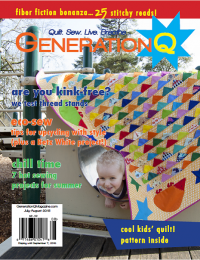 Generation Q Magazine – Melissa Kanovsky’s writing this one! This looks like a great book–he is coming to our guild meeting in May! Sorry, Neither. I don’t like chocolate. I’ve been told something is wrong with me. OOOO well. Dark Chocolate for sure! Plus, John is a great person, so an encouraging word from him as a teacher is just what I would expect. Sounds like the book is written just like John talks, which is great! Dark Chocolate, All the Way! 🙂 Thanks for the chance to win. 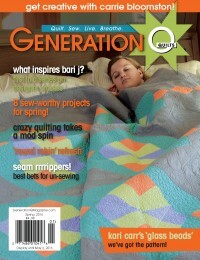 I’m loving the quilts in this book… and those created by some of the bloggers. Making me want to tackle curved seams again. 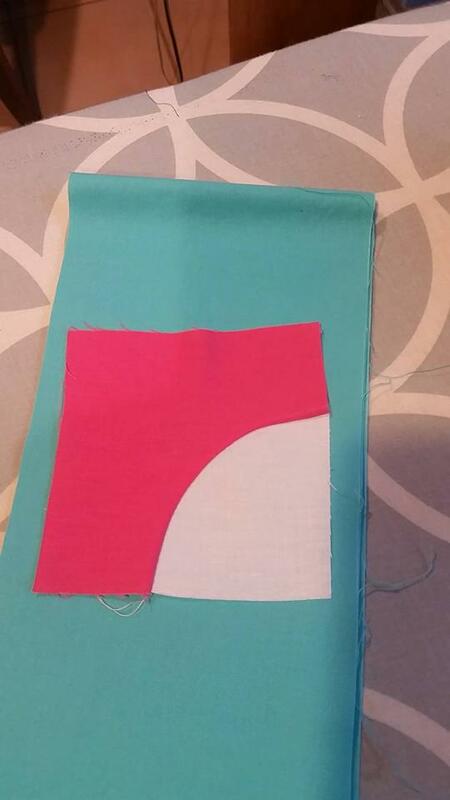 I find I love sewing curves ever since I sewed the first one! And dark chocolate all the way! Milk chocolate all the way. Don’t get me wrong, I like dark chocolate, but milk is my favorite! We have a little shop downtown that sells Belgian chocolates and they are heavenly. 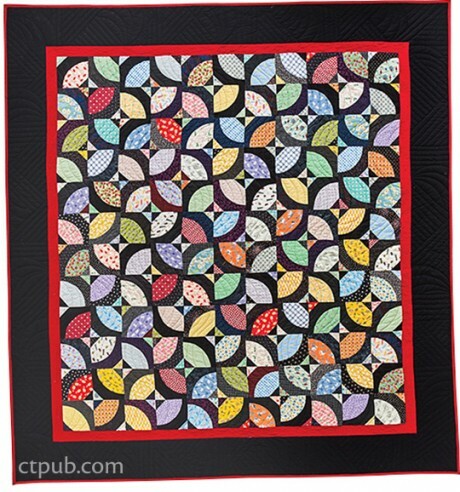 Chocolate improves your quilting. Milk or Dark Chocolate, Do I have to make a choice? I love them both! I love your cute little block. Pink and white are gorgeous together! It sounds like this book is a must have!! Oh, my. Dark chocolate, only dark chocolate! Dark chocolate ……… and can I have some coffee with that? Milk! This looks so intriguing! I love simplification of techniques and clear instructions. Sounds like this book offers both! Dark chocolate, and raspberry or cranberry adds to the luciousness! I’ll take dark chocolate, please! Along with that fetching book! Technically ANY chocolate! But milk if I must choose!!! Thanks for the giveaway. The joy is definitely in the journey! If the journey includes dark chocolate and fabric, I’m in! What a sweet trip! P.S. Love those curves, too! Dark chocolate-is there any other kind! My husband likes milk chocolate. I guess that’s “opposites attract” part! DARK chocolate. May I add a suggestion? Use very fine sewing pins, not those long flower ones, and when you pin,take just the tiniest “bite” in the two fabrics. It’ll be easier adjust as you sew that way. Eventually you won’t even have to pin! Put the convex piece on bottom,concave piece on top. Keep a finger between the two pieces and guide them to “meet” right under the needle. Easy peasey! 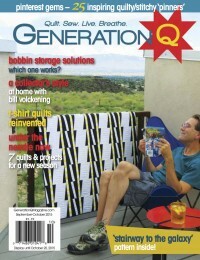 Love those quilts you’ve pictured. Definitely dark! My favourite is the Firecracker bar from Chuao Chocolate … It’s worth tracking down! Ooh. I don’t have the confident but sure do want to try and all. Dark chocolate for sure. Thanks.. Dark chocolate for sure. Love this book. always dark occasionally with almonds….Thank you! Dark chocolate all the way. Especially with fresh fruit. As I age (ahem) I’m beginning to prefer dark! Dark chocolate, for sure! After all, it’s good for you! What beautiful designs! For me it’s Milk Chocolate! Milk chocolate is my preference but dark is supposed to be healthier so I can eat more of it,right? Milk Chocolate is my favorite!!! 🙂 Thanks for chance to win your Give-a-way too!! Dark chocolate! Milk Chocolate only in desperation mode. Thanks for a chance to win! And I hope I do! Dark chocolate plain, milk chocolate if it has nuts. Dark Chocolate for me! This book looks fantastic. Milk all the way! I don’t like the bitterness of dark chocolate. I appreciate your philosophy of not treating anything as a mistake and just enjoying the process. I would definitely need that mentality to have success with curved piecing. It’s always intimidated me! Dark chocolate (with orange peel). Thanks! definitely dark chocolate!! Thanks for the chance to win! I used to only eat milk chocolate, but lately I am really enjoying dark chocolate. I feel like it takes less dark chocolate to make me feel satisfied, too, which is a plus! 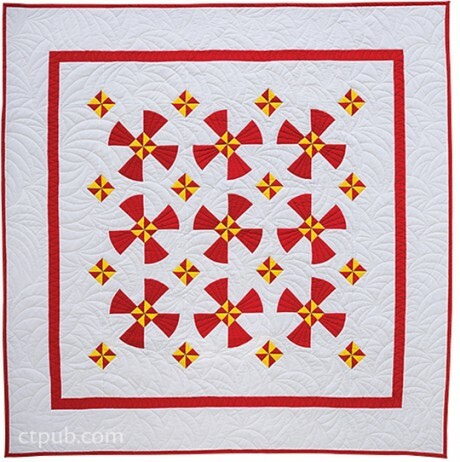 Some great quilts but have never been brave enough to try drunkards path. Dark chocolate for me – with marzipan if I can find it! Thanks for the giveaway, the book sounds like an adventure.